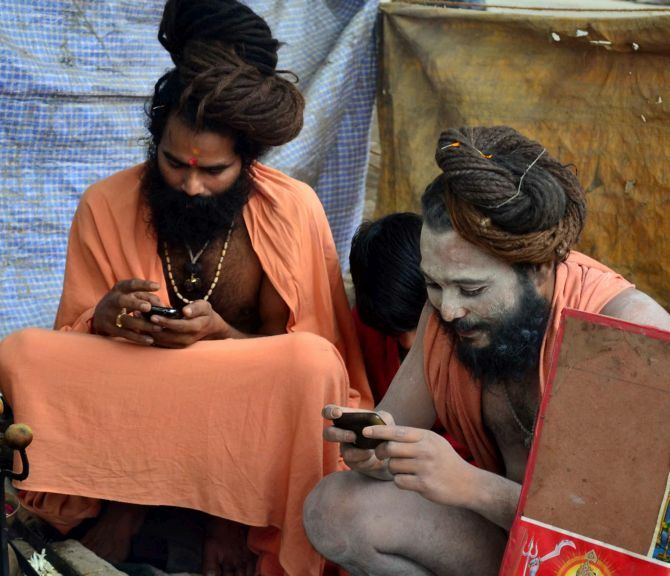 Rediff.com’s Sharat Pradhan visits the Magh Mela to find Naga sadhus busy twiddling away on their smartphones, using social networking tools to keep in touch with their followers. A majority of the Naga babas at the Magh Mela said WhatsApp and Facebook allowed them to reach out to a wider base and connect with people from all walks of live from all over the world. Photograph: Sandeep Pal. When one thinks of a baba or a seer one mostly pictures spirituality, long beards and simple living. However, amidst the thick of winter, Naga babas, who have converged at the Sangam in Allahabad to participate in the 45-day-long Magh Mela, are changing this image. This time round, it’s all about smartphones, Facebook likes and Whatsapp responses. It seems the Naga babas at the festival have finally taken to technology as most of them were busy seen texting away, communicating with their supporters on Whatsapp during the gala event. When Rediff.com approached a few ascetics and spiritual leaders who are camping out there, they said they were using WhatsApp to spread their word to their disciples. Furthermore, many of them added that they were now active on social media websites such as Facebook and Twitter too. “After all, we too are a part of the evolving society. So, I see nothing wrong in me or my colleagues becoming WhatsApp savvy,” asserted Naga baba Durgeshwari Giri at the festival. “We cannot ignore the new techniques and technology that are bringing a social revolution of sorts. It saves a lot of precious time,” he added. 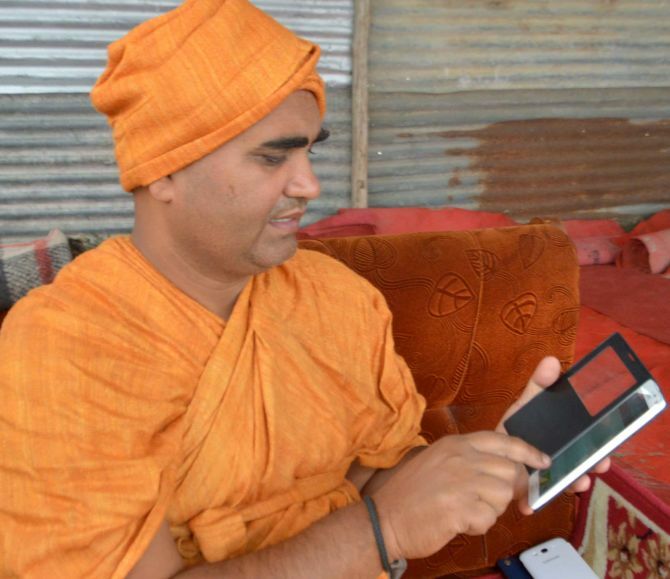 Acharya Balyogi Maharaj is yet another guru who uses the instant messaging platform to communicate to his followers. In fact, he has earmarked a time slot when he would respond to WhatsApp messages. “Maharajji is available on WhatsApp between 8 and 10 in the morning and from 10 to 11 at night, when he addresses problems raised by his followers,” disclosed his assistant. Popularly known as a ‘Mini Kumbh’, the Magh Mela is a key annual Hindu ritual held on the banks of the Sangam at Allahabad, and is spread over a span of 45 days between January and February. The main ritual involves taking a holy dip at Sangam on auspicious dates, which in 2015 were identified as January 5 (Paush Purnima), January 14 (Makar Sankranti), January 20 (Mauni Amavasya), January 24 (Basant Panchami) , January 30 (Maghi Poornima) and February 17 (Maha Shivratri). The key bathing dates attract nearly a million devotees to the temporary tent city erected on the banks of the Ganga. Guess what Wenger did before he became Arsenal manager?